RFNH = “Real Food Nutrition & Health” Study. My children and I will be working our way through Kristen Michaelis' book, Real Food Nutrition and Health, during the fall and winter months as part of our homeschooling curriculum. If you're following along, or falling behind, no worries! This series will be here for you whenever you're ready. And even if you're not quite caught up, feel free to jump in regardless. Click here to read more about the study and get the proposed schedule, as well as current and past downloadable discussion questions/activities each week — which you can save for the future if you're not going to participate now. We're on Chapter 3: Healthy Fats and Oils. Click here for Chapter 3's discussion questions/activities (a free PDF download). This was a long chapter, and frankly, I was worried how it was going to go over. Seemed very challenging to me when I prepared myself for it. We took a good hour+ to read through it and talk about it, stopping frequently to just review what we'd learned already. Now, none of my children are highschoolers, but I still think they got it! Well, at least A. and B. did. I didn't ask them to remember specifics — like lauric acid has how many carbon atoms? — but I hoped they would take away the basics of fats. Fats are macro-nutrients, in the company of carbohydrates and proteins. Fats share a common molecular structure, much like a backbone (glycerol) with ribs (fatty acids) — a similar visual picture to the one Kristen gave. Fats are either saturated or unsaturated. Saturated fats have a hydrogen atom attached to a carbon whereever possible. Unsaturated fats have a not-hydrogen atom bonded to a carbon atom at least somewhere. Monounsaturated fats have a not-hydrogen atom bonded to a carbon atom once. Polyunsaturated fats have a not-hydrogen atom bonded to a carbon atom more than once. 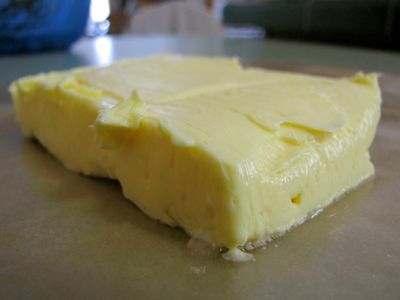 Saturated fats pack closely and well due to their chemical structure, keeping them solid at room temperature. Unsaturated fats don't pack so closely and well because of being differently bonded at least one place; thus they are liquid at room temperature and more susceptible to rancidity. Our bodies are composed of fats in this order: saturated fats, followed closely by monounsaturated, with polyunsaturated at less than 4% — the same percentages as traditional diets! Fats give energy, provide insulation, are building blocks, and help our bodies make the most use of fat-soluble vitamins (A,D, E, and K). Our bodies can synthesize needed fats, with the exception of essential fatty acids called omega-6 fats and omega-3 fats. The ratio in which we consume omega-6 to omega-3 fats is very important; keeping it between 1:1 and 4:1 is ideal for good health. The standard American diet offers a ratio of omega-6:omega-3 at 20:1, largely due to the high presence of corn in food production (corn's ratio is 46:1!). Traditional diets offered a ratio of 1:1 (omega-6:omega-3)! Isn't that alot to absorb? And there's more, too! I just tried to boil it down to the main points. Kristen recommended, and I agree, to consume animal fats from pastured, wild or traditionally raised animals. You see, if the animal is eating its traditional diet, then the balance of omega-6 to omega-3 fats in that animal's meat and milk will be closest to ideal. Grass-fed (but pasteurized) Kerrygold butter is arguably one of the best commercial options for butter. We stock up on the Kerrygold butter from Trader Joe's. But, when we're out of it and not planning a trip to get more (it is an hour away), sometimes I will buy a few sticks of grocery store butter to get us by. Well… now I am reminded of why that's not so good. Sure, any butter offers needed saturated fats and passably good flavor. But factory farm cows are fed on corn with a 46:1 essential fatty acid ratio — so their milk and meat ends up with an omega-6:omega-3 ratio that is not only off, but lends serious health implications to the eaters. So, butter is good, but grass-fed butter is better! And then there's raw, homemade grass-fed cultured butter, which I love to make when I can get the raw cream. So, it is your turn… How did your kids like this chapter? What did you learn? Anything shock you? Anything confuse you? If you compared the fats you eat to the fats of a traditional diet, where do you need to improve? What are you doing right? Any other thoughts? Please jump right in! Want to check out my daughters' blog posts? Each week they're sharing their answers to a couple of the discussion questions. I love reading how they put their thoughts into words. A. 's post and B. 's post. By Monday morning, I'll have the discussion questions for Chapter 4 available. Visit the main RFNH post for the schedule, links to other discussion questions, and links to all the blog posts in this series. 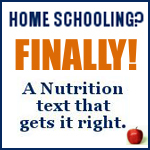 GNOWFGLINS will earn a commission on sales of the Real Food Nutrition and Health book through this blog. But honestly, we'd be doing this study whether or not we were associated. Thank you for supporting GNOWFGLINS with your purchase. You should also know I'm very thankful to be undertaking this study with Kristen's permission. This is so funny that you mentioned Kerrygold butter today. My husband and I were just talking this morning if its worth splurging on the Kerrygold from Trader Joe’s. We love it … such good flavor, creaminess, yellow color. We were leaning towards still buying it. I even said, “I think Wardee mentioned it once on her blog awhile back.” So it was so good to read that you are still buying it. Is Kerrygold organic too? I wasn’t sure since the packaging doesn’t really indicate, but thought that could be because its imported with different types of labeling requirements perhaps. I bought the Trader Joe’s organic butter a few times, and thought it compares to Tillamook butter. I was hoping that the Tillamook would be made from grass-fed cows (all that green, green grass over there! ), but maybe its really not. So I called my husband and I read the part about the ratio of fatty acids in grass-fed animal products compared to the regular commercial products. We decided we *will* continue to enjoy our Kerrygold butter! I am just starting out on my real food journey but it is always discouraging reading more because where I live, there are not enough options. I am weaning my family off margarine and financially it is a huge sacrifice to buy store butter, which is three times the price of margarine per weight and now I feel even that’s not good enough. Organic butter is more than $10 for 1 cup at the grocery store, which wouldn’t last long (and again just be feed lot butter). Kerrygold is not sold here. I did buy 4lbs of good coconut oil yesterday (huge sacrifice in our budget at $30, but a super steal where I live) so we would have nourishing fats, but DH really balked at it since he hasn’t “seen the light” yet. I am trying to make better choices but sometimes it is discouraging when we do not have the budget and do not have the options. Sorry for the mini-rant. I guess sometimes all we can do is the best we can do and if there is demand, more choices will come about. Maybe I will find good butter at the farmers market today 🙂 (I can never get eggs as they’re scooped up often before they even open). This is why I have been very vocal in our local real food movement. Change needs lots of people willing to rally for and support it. So many people are sheep and just do what they’ve always known, not knowing the choices they are making are very bad for them (even though where I live has the highest cancer rates of anywhere in my country, very bad!). Change needs examples for people to follow, open & free knowledge and again, demand! Even though the O in GNOWFGLINS stands for O, it is not the organic at the grocery store. No, we’re talking truly Organic, where the animals are in a living environment. So stick with the regular butter until something better comes along. Maybe by then, your family will be ready for it! I too am in the process of switching my family over to a better way of eating. I started along time ago with whole wheat pasta and organic veggies. But now I see that the meats and dairy are so much more important. It is difficult to pay $8/lb for chicken when I am so use to buying frozen Tyson chicken for $1.99/lb. Fortunately, I live in a large city and have LOTS of whole foods options. My bargain find is Natural Grocers. I can get grass fed all natural ground beef for $5/lb!! I really enjoyed this chapter on fats. I had switched my family over to almost 100% butter a while back as margarine is a crime against nature. And I use olive oil all the time. But I was shocked to read all the horrible things about vegetable oils! YIKES!!! I immediately went out and bought a jar of coconut oil after reading it. The coconut oil is going to take some getting use to as it has a strong coconut flavor. I will have to reserve it for sweet baked goods or tropical recipes for now. Dinah — I would agree with you that sourcing high quality dairy, meats, and fats is more important than the other components of our diet. You said, “Did you all understand that the fats of meats that are grass/pasture fed and free of all that nasty chemical stuff are the first choice for our fat intake?” The answer is yes. Reserving the bacon is a great idea, and that fat would be even better if the pigs were pastured. The bacon is good in that it is nitrate-free, etc, but how were the pigs raised? The fat is only as good as the animal was raised, you know? You can purchase tallow from USWellnessMeats, as an online supplier. I suppose you could ask around locally. I make my own tallow by retaining the fat from our yearly grass-fed beef purchase. It is sooo easy to render. Just pop it in the crockpot on low and pour off the melting fat (through a strainer) as it appears. You might find some at a Whole Foods. Yes! You can eat the skin on chicken! Many times I will save my chicken fat and use it to spread on toast, or for frying eggs, or sauteeing veggies. No need for it to go to waste! I do leave some fat in my stock so my soups taste better, but if there is alot of fat for some reason, I’ll repurpose it other ways. I’m really happy you wrote and hope this was helpful! Wardee, have you seen Alton Brown’s explanation of fats by using puppets on a toy train? When the trains are “unsaturated,” little nasty monsters can take up the unoccupied seats (rancidity). So trains with more seats open (polyunsaturated fats) are open to more rancidity monsters. Unfortunately, he comes to the conclusions that PUFAs are better frying oils, but I forgive him since he was making “The Case for Butter” before most people were re-warming to sat fat. And it’s a cute explanation. Jenn — No, I’ve not seen Alton Brown’s show on fats! I wonder if it is on the internet somewhere. The kids and I will have a look. Thanks for mentioning it for us, and all who follow! Hi, I have just discovered your site and it is brilliant. I have already tried the chocolate kefir which was delicious and have another few things I want to try. In relation to fats, I only use coconut oil, extra virgin olive oil or flaxseed oil but as far as butter goes I use ghee. How does this compare to the raw butter or the Kerrygold that you refer to. I am travelling at the moment and raw butter is not easy to get hold of. Samantha — Ghee, especially from grass-fed butter, is an exceptional choice for a fat. If not grass-fed, it is similar to regular butter. Of course it has superior qualities from its refinement, but ultimately it is only as good as the animal and the animal’s diet. Thank you for visiting GNOWFGLINS! I am curious if Kerrygold from Trader Joe’s would be better than Organic Valley’s Pasture Butter. I have been buying Organic Valley from a co-op thinking it was the healthiest, but you have me wondering if I should be getting Kerrygold??? Jill — It really is a judgment call. In my opinion, yes. The Kerrygold is better. They eat grass rather than grain. They’re in the sunshine rather than in a shed (or whatever it is called). Update: see next comment. Also, I fancy (but haven’t verified) that they’re eating grasses from mineral-rich, near-the-sea soil, giving them a healthier diet for that reason, too. Jill — I am replying again because the link that Julie shared (below — which somehow I’ve missed all these months!) says that Kerrygold, Organic Valley, and Tillamook cows are fed mostly on pasture. So that’s good news about the Organic Valley butter! I’m sorry for leading you astray earlier, as I was under the impression that OV and Tillamook were not pasture-fed cows. I purchase some Kerrygold butter to compare with my Organic Valley Pasture butter. I have yet to do a taste test, but the Kerrygold has a deeper color which leads me to believe that their is more nutrients in it. In those rare times you are forced to purchase ‘store’ butter, would it make you feel better about using Tillamook butter knowing it is recommended as one of the top 3 commercial brands by WAPF and realmilk.com? Julie — Yes, that would make me feel better, thank you! I am going to buy some tomorrow in fact. Just finished my Kerrygold. Julie — Just looked at the link and interestingly, Organic Valley and Kerrygold are the other two. 🙂 WAPF says they’re mostly pasture fed. I have read through that site so many times, I don’t know how I missed that. Thank you VERY MUCH for bringing it to my attention — as well as others who may read here.